In this article, we will be creating a sample spring boot application with REST APIs exposed. These REST APIs will be secured with OAUTH2 protocol with JWT as a TokenStore. In the client side, we will be creating an angular 7 based application to consume the REST APIs. Hence, the angular application will first get the OAUTH2 authorization token from an AuthorizationServer and then consume the REST APIs to perform CRUD operation on a User entity. Here we will be using a MySQL database to read user credentials instead of in-memory authentication. For a 3rd party authorization server such as Google, you can visit this - Spring Boot OAuth2 with Google. 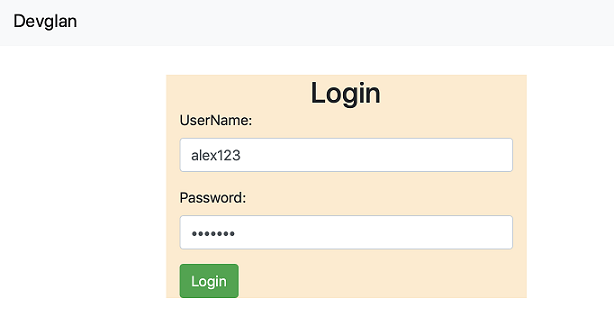 In short, we will be creating a full stack app using Spring Boot OAUTH2 and Angular 7.Though the client is built is using Angular 7, the same is valid with other Angular versions such as Angular 5 and Angular 6. In my previous articles, we have already created multiple spring boot applications using OAUTH2. Hence, we will be re-using some of the components from it. You can visit this for all the list on spring security applications that we have built earlier. Also, you can visit this angular 7 CRUD app to get started with Angular 7 app. Spring security OAUTH2 provides default token store but the implementation also provides functionality to define custom token store. Here, we will be using JwtTokenStore. Using JwtTokenStore as token provider allows us to customize the token generated with TokenEnhancer to add additional claims. OAuth 2 is an authorization framework that enables applications to obtain limited access to user accounts on an HTTP service, such as Facebook, GitHub, and DigitalOcean. It works by delegating user authentication to the service that hosts the user account, and authorizing third-party applications to access the user account. OAuth 2 provides authorization flows for web and desktop applications, and mobile devices. OAuth2 provides 4 different roles. This class extends AuthorizationServerConfigurerAdapter and is responsible for generating tokens specific to a client.Suppose, if a user wants to login to devglan.com via facebook then facebook auth server will be generating tokens for Devglan.In this case, Devglan becomes the client which will be requesting for authorization code on behalf of user from facebook - the authorization server. Here, JwtAccessTokenConverter is the helper that translates between JWT encoded token values and OAuth authentication information. We have added our custom signature to make the JWT token more robust.Apart from JwtTokenStore, spring security also provides InMemoryTokenStore and JdbcTokenStore. 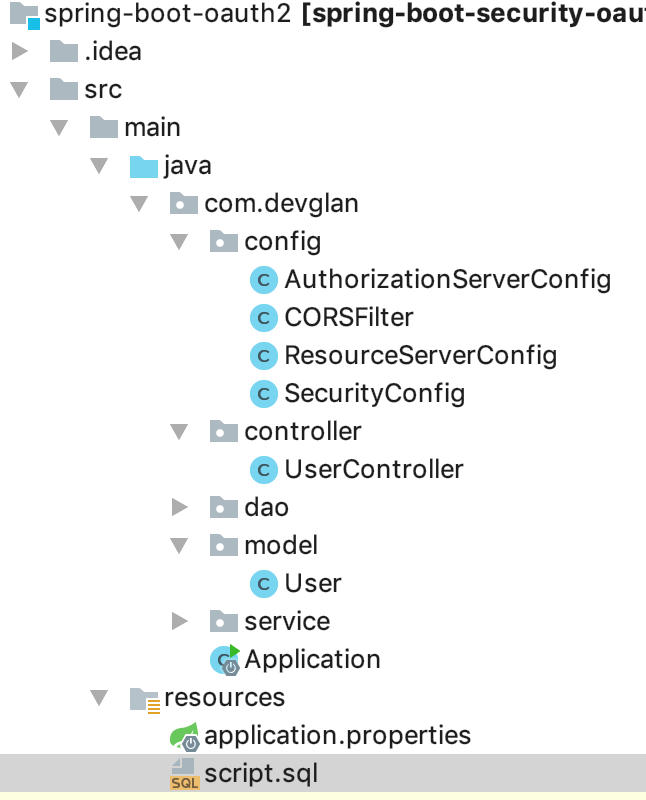 Here, we are using in-memory credentials with client_id as devglan-client and CLIENT_SECRET as devglan-secret(bcrypted here in Spring Boot 2).But you are free to use JDBC implementation too. @EnableAuthorizationServer: Enables an authorization server.AuthorizationServerEndpointsConfigurer defines the authorization and token endpoints and the token services. You can use this tool to generate Bcrypt password with plain-text online. Resource in our context is the REST API which we have exposed for the crud operation. To access these resources, the client must be authenticated. In real-time scenarios, whenever a user tries to access these resources, the user will be asked to provide his authenticity and once the user is authorized then he will be allowed to access these protected resources. resourceId : the id for the resource (optional, but recommended and will be validated by the auth server if present). This class extends WebSecurityConfigurerAdapter and provides usual spring security configuration.Here, we are using bcrypt encoder to encode our passwords. You can try this online Bcrypt Tool to encode and match bcrypt passwords.Following configuration basically bootstraps the authorization server and resource server. @EnableWebSecurity : Enables spring security web security support. Now let us define our controller class. Below is the default script that can be used for first use. First we will be generating an Angular 7 app using angular cli and then create different components for create, edit, add and delete user. 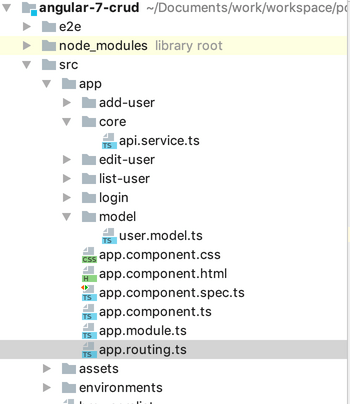 The step by step demonstration of creating Angular 7 app can be found in my previous article here - Angular 7 CRUD App.Below is the project structure for the same. Below is the list of command that we have used to generate above project structure. Check the login API here. This is exactly as per the API definition we defined above. After a successful login, list-user route will be loaded and getUsers() will be invoked that will load the list of users from the API and the user list will be shown in a tabular form. 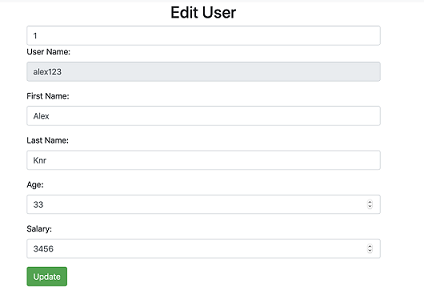 Each row will have a button to either update or delete any user entry. Add button will open a new form to add a new user. On click of the edit button, the selected user id will be cached in session storage and edit component will be loaded with user details auto populated from the DB. A click on delete button will instantly delete the user from DB and update the table. Following is our angular module and routing configuration. In this article, we discussed about implementing Spring Boot OAUTH2 with Angular application. We configured our authorization server and resource server using OAUTH2 and secured our REST APIs. The same REST APIs was accesses with angular client after generating JWT OAUTH token.